Shannon's blog has quickly become one of my absolute FAVS. She posts often, and includes really great pictures of her thrifting treasures, home projects, and cute outfits. She recently gave up sugar, dairy, and white bread and has shared some really impressive results. I have felt SO motivated ever since to eat better, although my M&M addiction is still going strong (yes, I'm ashamed). Her house is the best part of it for me. I mean, just LOOK AT HER HOUSE. You can see more amazing before and after shots of her home here. And be sure to add 8FOOTSIX to your reader, you'll love it. What do you like most about writing 8FOOTSIX? My favorite part of blogging is the encouragement to 'do'. Since I blog about what is happening around our home, we need to keep busy in order to have something (hopefully) interesting to say! I still see myself blogging in a few years. 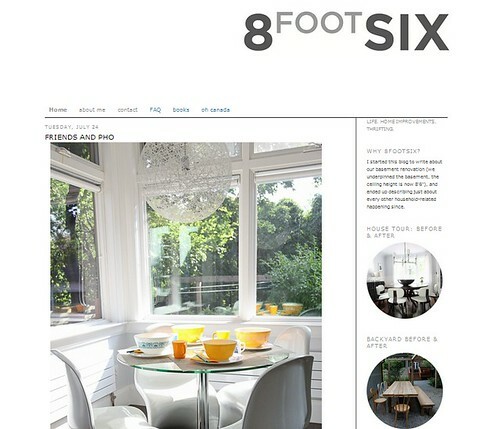 However, I hope the content of 8FOOTSIX continues to improve. Better writing, better photography. Oh, and I want an excuse to use power tools! I have help with the kids on Fridays. That is my day to make phone calls, doctors appointments, shopping, uninterrupted exercise, putter...the rest of the week I have to be a sneak about it! I try to make each day a little different, but let's be honest - they are all essentially the same! The baby is on a two nap schedule so the world revolves around his sleep! We go out for a walk everyday: to the library, park, shopping, thrifting, fetching groceries, hanging out at toy store or bookstore, watching the subway trains (from the bridge on the beltline) or to have some other adventure! Something always needs to be cooked or cleaned! I am trying to become a better cook. For now, my older son doesn't want to play alone, and the baby is teething, so I haven't been able to escape to the computer to blog. Some days are definitely easier than others! I try not to give advice! I am still trying to figure things out! 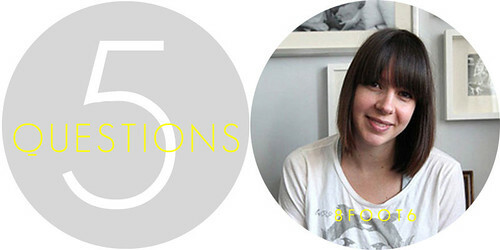 Thanks Shannon for being a part of the Five Questions series! I have so much fun blogging! I hope it shows! I love this series. Her house is stunning! This series is fabulous - these amazing bloggers are so inspiring (and I'm not even a blogger)!!! And you are right about her home - incredible. I love Shannon's blog and yes, her some is insanely beautiful!! Her days sound pretty similar to mine... I think an 8 month baby will do that to ya! Ha ha, yes, me too! !